The tutorial explains what the Compound Annual Growth Rate is, and how to make a clear and easy-to-understand CAGR formula in Excel. In one of our previous articles, we unveiled the power of compound interest and how to calculate it in Excel. Today, we'll take a step further and explore different ways to compute Compound Annual Growth Rate (CAGR). In simple terms, CAGR measures the return on an investment over a certain period of time. Strictly speaking, it's not an accounting term, but it is often used by financial analysts, investment managers and business owners to figure out how their business has developed or compare revenue growth of competing companies. 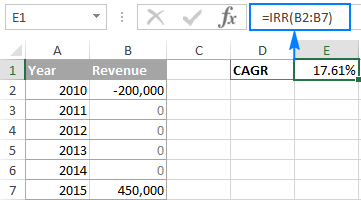 In this tutorial, we won't be digging deeply in arithmetic, and focus on how to write an effective CAGR formula in Excel that allows calculating compound annual growth rate based on 3 primary input values: investment's beginning value, ending value, and time period. What is Compound Annual Growth Rate? Compound Annual Growth Rate (CAGR for short) is a financial term that measures the mean annual growth rate of an investment over a given period of time. Average annual growth rate (AAGR) is the arithmetic mean of a series of growth rates, and it is easily calculated using a normal AVERAGE formula. However, it totally ignores the compounding effects and therefore the growth of an investment can be overestimated. Compound annual growth rate (CAGR) is a geometric average that represents the rate of return for an investment as if it had compounded at a steady rate each year. In other words, CAGR is a "smoothed" growth rate that, if compounded annually, would be equivalent to what your investment achieved over a specified period of time. 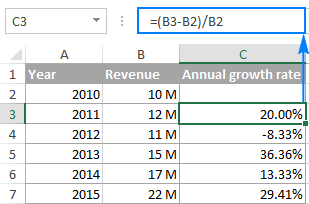 Now that you have a basic idea of what Compound Annual Growth Rate is, let's see how you can calculate it in your Excel worksheets. 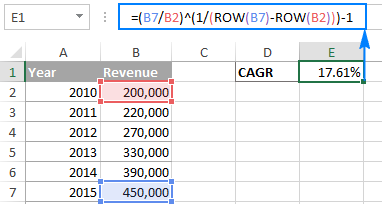 Overall, there are 4 ways to create an Excel formula for CAGR. If you have all investment values listed in some column, then you can add a degree of flexibility to your CAGR formula and have it calculate the number of periods automatically. Tip. If the output value displays as a decimal number, apply the Percentage format to the formula cell. 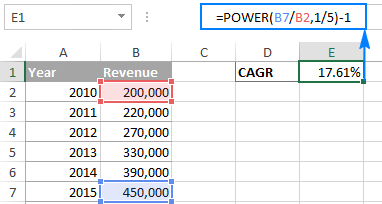 Another quick and straightforward way to calculate CAGR in Excel is by using the POWER function that returns the result of a number raised to a certain power. Where number is the base number, and power is the exponent to raise the base number to. 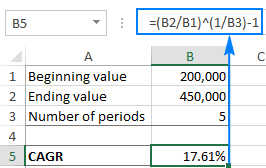 One more method for calculating CAGR in Excel is using the RATE function that returns the interest rate per period of an annuity. At first sight, the syntax of the RATE function looks a bit complicated, but once you understand the arguments, you may like this way to calculate CAGR in Excel. Nper - the total number of payments for the annuity, i.e. the number of periods over which a loan or investment should be paid. Required. Pmt - the amount of the payment made each period. If omitted, the fv argument must be supplied. Pv - the present value of the investment. Required. Fv - the future value of the investment at the end of nper payments. If omitted, the formula takes on the default value of 0. 0 (default) - payments are due at the end of the period. 1 - payments are due at the beginning of the period. Guess - your guess for what the rate might be. If omitted, it is assumed to be 10%. Note. Be sure to specify the beginning value (BV) as a negative number, otherwise your CAGR formula would return a #NUM! error. Values - a range of numbers that represent the cash flows. The range must contain at least one negative and at least one positive value. [Guess] - an optional argument that represents your guess at what the rate of return might be. If omitted, the default value of 10% is taken. The beginning value of investment should be entered as a negative number. The ending value of investment is a positive number. All intermediate values are zeros. Well, this is how you can calculate CAGR in Excel. If you have been following the examples closely, you might have noticed that all 4 formulas return the identical result - 17.61%. To better understand and probably reverse-engineer the formulas, you are welcome to download the sample CAGR Calculation Worksheet. I thank you for reading and hope to see you on our blog next week! 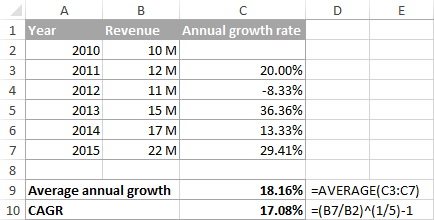 10 Responses to "How to calculate CAGR (compound annual growth rate) in Excel - formula examples"
I have a table in which first column i add date 1 July to 26 July 2016. In second column, I give rating to me (e.g. 0 to 10). I want to sum my rating only past 5 days but when last 5 day rating is less than 2, then add one more day. e.g. when I sum last 5 day (21 July to 26 July) is 22, but 23 July my rating is less than 2 than I add one more day in rating (20 July to 26 July) than my rating is 27, I remove 23 July in my life. Can you you help me in this. The result will be 17.61% like in all other formulas. write the output of the below triangular pyramid java program? Below is the problem that I already know the answer of 7.1% is the correct one. I must be making an error with the power function because I get a CAGR of 7.25% which I know is wrong. Thanks for any help. Thanks again if anyone can help! Kindly CAGR procedure for investment in different date and value i.e.